Our Worldwide First: PowerFoil. 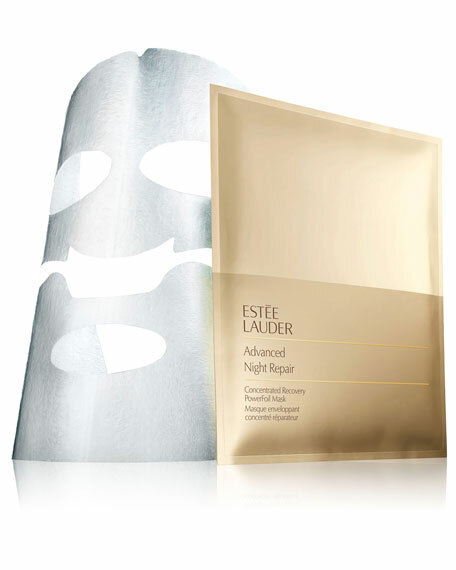 High-performance foil-backed sheet mask creates a protective barrier, allowing our potent technologies to penetrate fast and deep within skin's surface and helping to lock in moisture. 2X Hyaluronic Acid. Each treatment delivers a surge of liquid revitalization, immersing skin in a double dose of Advanced Night Repair Serum's powerful moisture magnet. Also includes our proven ChronoluxCB technologies. Experience an ultimate infusion of youthful moisture. How To Use: Apply on clean skin, once a week at night. Remove mask, carefully unfold and apply bottom half first, then top half. Leave on for 10 minutes, then remove mask and gently massage in any remaining liquid. For in-store inquiries, use sku #1825524.